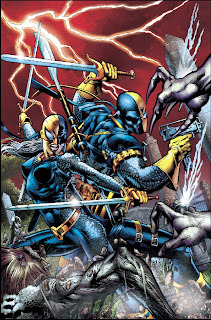 DC SourceBlog: What’s the one thing that’ll bring Deathstroke and Ravager together? Black Lanterns, of course. Here’s the cover to TEEN TITANS #78, by Joe Bennett, Jack Jadson and Rod Reis. So...issue #77 is by J.T. Krul. Issue #78 is by Joe Bennett, who just did that abortion of a three parter that telegraphed the death of Eddie Bloomberg from issue one and then acted as if it was a surprise. I ask again--what happened to this Felicia Henderson woman? Damn you, Didio. Damn you to hell! It hurts... Why must it hurt? Does Didio just not like the fans? Avoid this upcoming issue like the plague!